It’s back by popular demand.! You have a chance to win $580 worth of stellar productivity apps from The Omni Group for your Mac thanks to Cult of Mac Deals. If you’ve been on the lookout for some of the best productivity Mac apps on this planet, Cult of Mac Deals has got you covered. One lucky winner is going to take home 5 of The Omni Group’s top-notch apps that will level up both your home and work life. OmniPlan [$200] – OmniPlan is designed to help you visualize, maintain, and simplify your projects. Break down tasks, optimize the required resources, control costs, and monitor your entire plan—all at a glance. 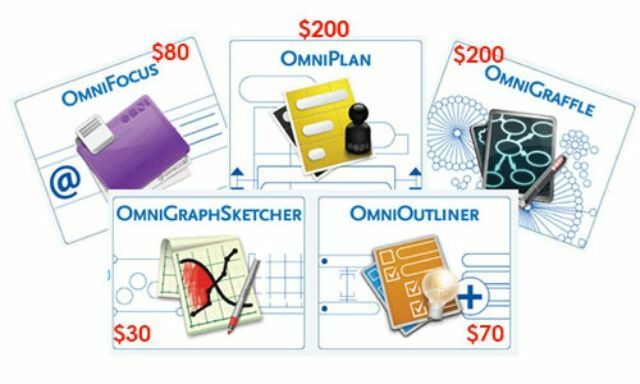 OmniGraffle [$200] – If you need a diagram, process chart, quick page-layout, website wireframe or graphic design, OmniGraffle can help you by keeping lines connected to shapes even when they’re moved, providing powerful styling tools, importing and exporting Microsoft Visio files, and magically organizing diagrams with just one click. OmniOutliner [$70] – Use OmniOutliner to draft to-do lists, create agendas, manage tasks, track expenses, take notes, plan events, write screenplays … and just about anything else you can think of. OmniGraphSketcher [$30] – Specifically designed for reports, presentations, and problem sets where you need to produce sharp-looking graphs on the fly, OmniGraphSketcher combines the data plotting power of charting applications with the ease of a basic drawing program. OmniFocus [$80] – OmniFocus is designed to quickly capture your thoughts and allow you to store, manage, and process them into actionable to-do items while helping you to work smarter via powerful tools for staying on top of all the things you need to do. Connect with Facebook (button is to the right side of the page). Get social by sharing the giveaway with the social buttons – the more you share the better the chances you’ve got to win! What are you waiting for? Enter now and give yourself a chance to win 5 awesome productivity apps!